Balance Studio values the importance of building community and creating awareness around health, wellness, culture and the healing arts. We are dedicated to serving our community and enriching the lives of individuals across the lifespan. Space is also available for workshops, classes and events. Conveniently located in Fremont, across from Theo Chocolates. 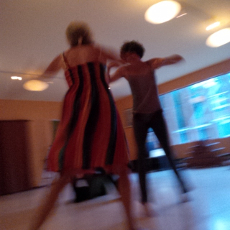 2:00pm - 9:30pm: Open studio time for rehearsals, private classes and workshops. 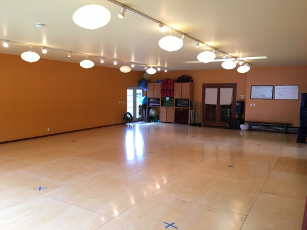 1:30pm - 4:00pm: Open studio time for rehearsals, private classes and workshops. Check Bahiainmotion.com for class dates. 1:30pm - 9:30pm: Open studio time for rehearsals, private classes and workshops. 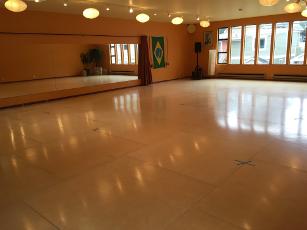 Balance Studio is available to rent for workshops, events, rehearsals and private classes. 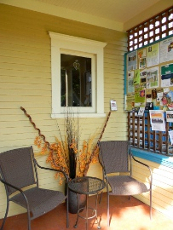 Contact us for space availability. This rental rate includes a 15-minute grace period for before and after class set-up/break-down and other class/workshop/event necessities. * Please note these rates refer to private (1 person) or semi-private classes (2 persons) only. Classes with 3 persons or more are charged the group rate class of $30/hour. 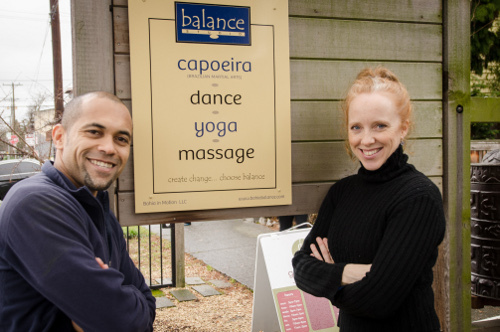 Daniel Nery dos Santos Filho and Aileen Panke are co-owners of Balance Studio. Their story began in Salvador, Brazil where they met in 2004 studying dance. They shared a dream of opening a studio which offered a place to build community and promote wellness. In 2008 they married and moved to Seattle, WA. They have worked diligently over the past 9 years to create Bahia In Motion and Grupo de Capoeira Moringa de Barro. 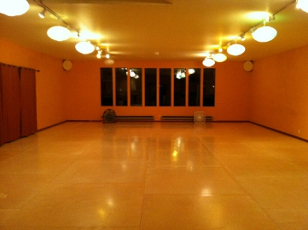 In June 2012, they opened Balance Studio. Daniel and Aileen’s work is rooted in their firm belief of the importance of a balanced body, mind and spirit and the integral role nature plays in nurturing this balance. They are committed to building community and enriching the lives of individuals across the lifespan. Dance into health with Nia! A mind-body wellness and fitness format designed for everybody, Nia combines the the expressiveness of dance, the power and explosiveness of martial arts, and the wisdom and mindfulness of the healing arts. No previous experience required! Nia invites you to move your own unique body's way. Classes are one hour and practiced barefoot to soul-stirring music. Jason Alan Griffin was Seattle’s first Nia teacher, going back to 1996. Since then he has taught all over the USA and internationally. He is a First Degree Black Belt and has also studied acting, personal training, massage therapy and professional dance, so his classes are full of education, experience and passion. He loves to play and is motivated by learning and teaching. Every class offers a unique challenge while being very fun and accessible at the same time. Beginners are just as welcome as veteran movers and athletes. 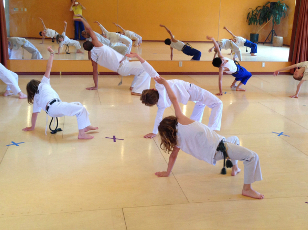 Nia is a fun fusion of martial arts, dance arts and healing arts. It’s a dynamic cardiovascular workout to boot! Benefits are better balance, strength, mobility, and flexibility. Before you know it you’ll feel recharged, livelier! 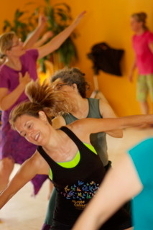 Each class offers options for every body; as well as fun, easy choreography to a medley of music. Come barefoot or enjoy your soft-soled shoes. See you there! Naomi Scher is an avid, life-long dancer, starting with doing the fox trot atop her daddy’s shoes. Pink tutus followed, then jazz, modern dance, then the Skinner Releasing Technique (Cert.1983). Now Nia has won her heart big time, Brown Belt and all. Black Belt targeted for September, 2019! Certified in Nia FreeDance and Nia Moving to Heal. Come dance with me! 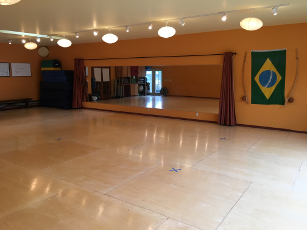 Come celebrate Brazilian rhythm and dance in this fun and energetic class! Learn dances that draw from the rich cultural traditions of Bahia and Northeast Brazil, including Afro, Samba Reggae, Samba de Roda, Dances of the Orixas, Forro and Carnaval/Street dances. The cultural context and history behind these dances are also integrated into class. A diverse selection of the enchanting rhythms and music from Brazil accompanies you throughout class. You’ll learn how to recognize the rhythms specific to each dance. This blend of vibrant Brazilian rhythms and movement leaves your body invigorated and your spirit refreshed! No experience needed. Daniel was born and raised in Salvador, Brazil where he studied, performed and taught Capoeira and Afro-Brazilian dance for 18 years before moving to the U.S. in 2008. In Seattle, Daniel with his wife Aileen co-created Bahia In Motion and Grupo de Capoeira Moringa de Barro, offering Brazilian dance and Capoeira classes and to adults and youth in the Seattle area. Daniel is also a certified Zumba instructor and is co-owner of Balance Studio. With much enthusiasm, Daniel joyfully shares his native Afro-Brazilian culture through Capoeira and dance, two of the most significant artistic expressions of Black Brazilian culture. Daniel's extensive professional training and ability to transmit the vibrant energy of Bahia, Brazil produce fun, creative and invigorating classes. MOVE IN THE HEART OF RHYTHM... with this lively, accessible mix of traditional and contemporary poly-rhythmic styles. With Lara’s unique understanding of Afro-fusion sounds, basic steps and choreography are designed to inspire. The simplicity of the format invites each dancer to cultivate their own joyful, personal experience inside roots oriented group movement. Customized daily for mixed levels, this class deepens movement skills, cultivates strength, ease and nuance, while tuning awareness with some of the best music the world has to offer. Series spaces are limited. Contact Lara to sign up. Pay-as-you-can and scholarship options available. 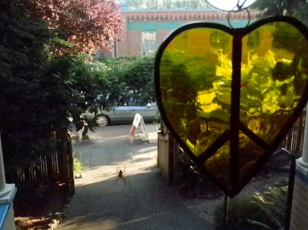 Lara McIntosh is an active member of Seattle dance, music, public art and drum communities. 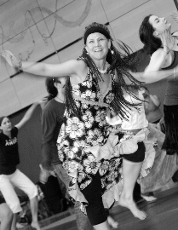 Lara is the originator of Wassa Dance and has been teaching independently since 1997. As a teacher, she explores rhythm, spirit, craft, and community to unlock the movement potential in each person. Her inclusion of dance styles and music of the African diaspora are greatly inspired by lifetime studies and travels to Brazil and Mali, West Africa. She offers school residencies and conducts intensive workshops in Washington State and Hawaii. 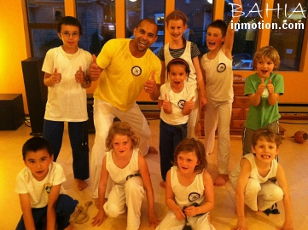 Grupo de Capoeira Moringa de Barro's home started in 2008 at Planet Earth Yoga, now Balance Studio. We are an ever-growing family of Capoeiristas from Seattle and Brazil. We practice Capoeira Regional (fast-paced) although the Angola style of Capoeira (slower-paced) is also incorporated into classes. Our Mestre hails directly from Salvador, Bahia where Capoeira Regional was created by Mestre Bimba. Classes are dynamic and engaging, as we work individually, in pairs and in groups. Mestre Pitta believes Capoeira teaches us how to live more peacefully by learning to respect ourselves, each other and cultures throughout the world. Mestre Pitta was born and raised in Salvador, Brazil where he studied, performed and taught Capoeira and Afro-Brazilian dance for 18 years before moving to the U.S. in 2008. In Seattle, Daniel co-created with his wife Aileen Bahia In Motion and Grupo de Capoeira Moringa de Barro, offering Brazilian dance and Capoeira classes and to adults and youth in the Seattle area. Daniel is also a certified Zumba instructor and is co-owner of Balance Studio. With much enthusiasm, Daniel joyfully shares his native Afro-Brazilian culture through Capoeira and dance, two of the most significant artistic expressions of Black Brazilian culture. Daniel's extensive professional training and ability to transmit the vibrant energy of Bahia, Brazil produce fun, creative and invigorating classes. Welcome to Nia with Shea. Nia is a joyful fitness fusion, a collaboration of Martial Arts, Modern Dance and Healing Arts designed with the intention to give an amazing cardio workout with great music. We will condition through the five sensations of fitness: flexibility, agility, mobility, strength and balance. You will optimize your physical fitness using anaerobic conditioning and exhilarating sequences. Each class is about growing community, elevating health and empowering us all to do great things. "Shea Marsh has an athletic, fun and consciously daring style.” I am a fitness enthusiast! After 10 years of being a running coach and personal trainer, I noticed my body was loosing mobility and flexibility. One morning in 2008 I tried a Nia class. My body celebrated, my mind was challenged and my spirit beamed. Because of Nia, each year I am increasingly more mobile, flexible, balanced, and agile. In one hour your creative self will flourish and your body will sweat! Embrace your conditioning. Live your dance! Calling: All hearts and bodies are honored! Come refresh and center with Beth and find connection with yourself and those around you through attention to breath and body awareness in this class combining Yin and Yoga Nidra practices. Yin Yoga fosters awareness, relaxation, increased circulation in joints and improvement in flexibility. Yin Yoga is a passive form of Yoga in which there are a series of long-held postures near and on the floor. Yoga Nidra is a guided meditation practice allowing deep relaxation. A perfect way to end your week. Beth's love for the practice of yoga shines through in her teaching. She centers her classes around breath and body awareness, using her calm and authentic voice to create a nourishing space for practitioners to immerse themselves through mindfully crafted sequences. Beth began her yoga practice in 2001 in a college elective and has since been found practicing beneath trees, in parks, at schools, on mountain trails and tops, and countless studios ever since. Her love and passion for the practice continues to grow. After years of studying on her own and sharing the practice with anyone who would show up, she was thrilled to take part in Be Yoga Burien’s inaugural teacher training programs in 2018. Through this, she completed her 200 hour teacher training in the style of vinyasa with Audrey Benton and Nina Graniter, 200 hour training in yin yoga with Audrey Benton and Jordan Grimmer, as well as became certified in yoga nidra delivery with Audrey Benton. When she’s not in the studio, Beth can be found hiking through the Pacific Northwest with her 5-year old daughter, laughing and walking with friends, and teaching as a special education teacher. She aspires to bring yoga into the classrooms and into spaces where youth need a little extra care, hoping to bring connection to health and wellness to our younger generations. This class combines elements of Afro-Brazilian dance with the vibrant music and movement of Bahia in the northeast of Brazil. Samba Reggae rhythms are a blend of west African, Samba and Caribbean rhythms. Samba Reggae music and dance is often performed in the streets of Bahia during Carnival and parades and processions celebrating Afro- Brazilian culture. The class combines easy-to-follow steps with the joy of Bahia’s signature rhythm and leaves you smiling inside and out. No experience needed. Move your body to grooves from Guinea, West Africa with Sarah Lee Parker. Great teaching, interesting choreography and a nurturing environment make these very fun and inviting classes! This class is both a great introduction to West African Dance, AND a great place to expand into intermediate/advanced level dancing. You will learn posture, technique, movement vocabulary and steps, all to live infectious music provided by the One World Dance Band. Sarah Lee Parker graduated with honors and a Bachelor of Science degree in Health and Wellness (Exercise Science, Public Health, Youth Studies and Nutrition) from the University of Minnesota. She has been a member of the University of Minnesota Repertory and Hamanah Don Dance Companies, managed the Fitness Program at the West Seattle YMCA, and is currently a Personal Trainer and Life Coach working with people one on one to heal, expand and transform their physical, mental and emotional capacities. A true healer in the best sense of the word, her infectious enthusiasm, playfulness and generosity of spirit, make her the perfect ambassador for the West African traditions that she shares from her heart. Join Camille Dodson for Family Yoga Classes: Fridays July 14- August 25 from 12:30 to 1:15. We'll learn poses, breathe together, play games, dance, laugh, and relax. Parents will find much needed relaxation while kids learn to connect with their bodies and breath, all while having fun! Pay a flat rate of $20 for the whole family when you pre-register for all six weeks! Camille Dodson has a Master's degree in International Child Studies, and 6 years of experience teaching yoga to children, teens, and adults. I have worked with children of all ages and with a wide range of learning, social, and developmental disabilities. This class is accessible to all and aims to create a safe, welcoming space to provide growth, techniques for relaxation, self-regulation, and fun! JourneyDance to Bliss blends Desire Mapping, Creative Movement, Journaling, Meditation and Visualization into a fun, insightful and powHERful workshop experience. Created and taught by Barbara Badolati. Barbara Badolati: Soul Stirrer, Movement Devotee, Biz/Life Coach, EmpowHERment Igniter, Creator of Live Blissful, Blissful Business Mentorship and Be Well Retreats worldwide. Zumba® fuses hypnotic Latin rhythms and easy-to-follow moves to create a one-of-a-kind fitness program. 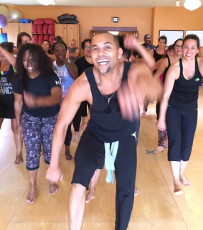 Daniel adds his Brazilian flavor to the mix to create a fun, dynamic workout that leaves you smiling and exhilarated! Check it out! Zumba is a great way to stay fit while having fun. Daniel was born and raised in Salvador, Brazil where he studied, performed and taught Capoeira and Afro-Brazilian dance for 18 years before moving to the U.S. in 2008. In Seattle, Daniel co-created with his wife Aileen Bahia In Motion and Grupo de Capoeira Moringa de Barro, offering Brazilian dance and Capoeira classes and to adults and youth in the Seattle area. Daniel is also a certified Zumba instructor and is co-owner of Balance Studio. With much enthusiasm, Daniel joyfully shares his native Afro-Brazilian culture through Capoeira and dance, two of the most significant artistic expressions of Black Brazilian culture. Daniel's extensive professional training and ability to transmit the vibrant energy of Bahia, Brazil produce fun, creative and invigorating classes.